Gluten Free, Vegan Mac 'N Cheese - the Guilt Free Mac! Home > Magazine > The Guilt-Free Mac: When Mac ‘N Cheese Went Gluten-Free and Vegan! My eleven-year-old stepson isn’t vegan, but boy, did his eyes perk up when he saw what we were having for dinner last night. Vegan mac ‘n cheese! To be honest, I’ve been vegan for over six years, and I’ve only craved mac ‘n cheese a few times. Up until a couple of months ago, I pretty much gave up my quest to satisfy that craving, because no boxed or homemade vegan version of mac ‘n cheese had quite hit the spot. That is, until I discovered Daiya’s Cheezy Macs! Dairy cheese is usually the hardest food to give up when transitioning to veganism. Because of its versatility and addictive qualities, it has crept into so many recipes, becoming a staple in many Western diets. And while many people, vegan or not, lead perfectly healthy lives without dairy or dairy substitutes – when it’s done right, cheese alternatives can bring a sense of comfort and familiarity to those of us who have made the change. Cheese addiction can be difficult to overcome. Fortunately, there are new alternatives coming out that taste absolutley great! If you are a cheese lover, check out our vegan cheese collection below! Unfortunately, I’ve also noticed that dairy cheese is generally the hardest food to imitate when it comes to cruelty-free ingredients and production. I’ve had vegan cheeses that tasted great but had strange textures and vice versa, and some had just missed the mark altogether. 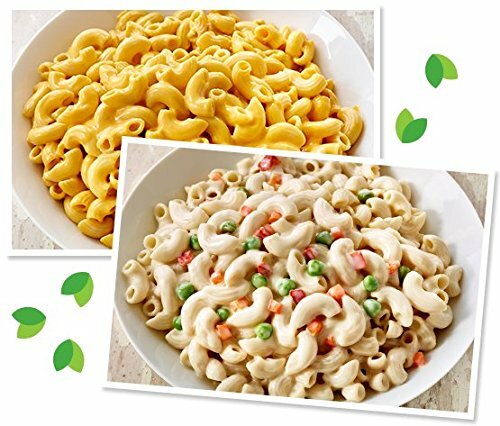 At the moment, there are a handful of boxed vegan mac and cheeses out there for a quick and easy comfort food fix. But if you have gluten and/or soy sensitivities, your choices are significantly limited. As I mentioned above, I’ve tried a number of vegan mac and cheeses, and in my opinion, Daiya’s Deluxe Cheddar Style and Deluxe Alfredo Style are by far the best. And I can say with confidence that my stepson agrees (especially if you combine the two for a melty gold mine of vegan mac ‘n cheese goodness). Daiya’s vegan mac ‘n cheese to the rescue! A delicious variation of the traditional dish, that’s also gluten-free! I’m always a little cautious of sharing vegan cheeses I haven’t tried with my non-vegan friends and family, because I don’t want them to think that all vegan cheeses taste or feel the same. Generally speaking, if they try one they don’t like, they’re hesitant to try others. So I tend to go with what I trust. And when it comes to mac ‘n cheese (and a variety of other cheesy options), I know Daiya’s vegan mac ‘n cheese has me covered. Daiya has been leading the way in the world of cruelty-free cheese for nearly a decade, with an impressive line of cheeses that are a perfect substitute in nearly any non-vegan cheese-a-licious recipe. And it has been the one brand, hands down, that’s gotten the velvety smooth yet hearty nature and flavor of dairy mac ‘n cheeses down pat. As someone who lives in a body that does not react well to gluten, when I discovered that their yummy comfort food in a box is made out of whole grain brown rice, that’s what sealed the deal. It’s an all around great cruelty-free, healthier-than-dairy snack, comfort food, soul food, family meal, or any other excuse you can come up with for eating mac ‘n cheese. It’s twice as expensive (if not more) than the other vegan mac ‘n cheeses on the shelf. So at this rate, it’s more of a special occasion meal than a weekly regular. All in all, Daiya has done a great job finding the missing puzzle piece to a satiny smooth, super tasty, cruelty-free and guilt-free American classic. Love cheese? We do too!